dCloud Credentials – these are specified by you when you sign up for a dCloud account, and should be entered in here. This will of course enable dCloud features and functionality within d7. Encryption Password – The encryption password is created by you and not shared with me; is used to encrypt/decrypt your d7 configuration set when transferring to/from dCloud, and is a required field. d7 will store this password (encrypted of course) within the d7.ini file. This password MUST be the SAME on all of your various d7 copies, and if it is set incorrectly your configuration will not be decrypted properly! You may change this password at any time, but after you do you will need to re-upload your d7 configuration set to dCloud, and configure all of your various d7 copies with the new password. 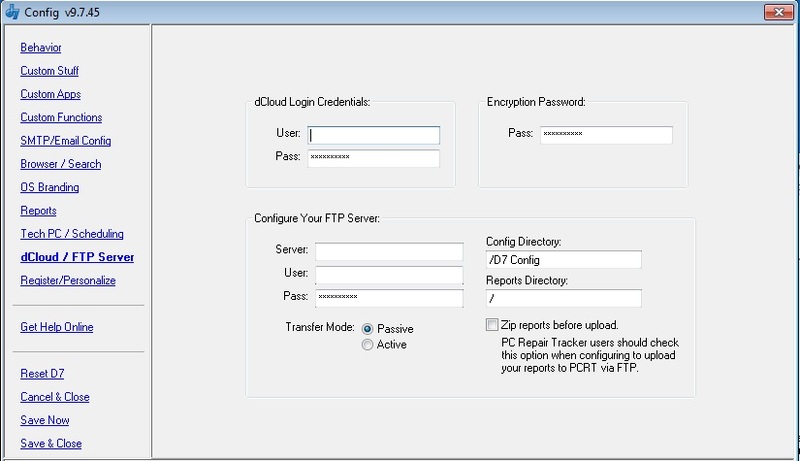 Configure your FTP Server – This configuration is used for the FTP menu within d7 (or for PC Repair Tracker integration.) Note that if Transfer Mode: Active is available in your copy of d7, it will not function properly when selected. At the time of this writing only FTP Passive mode is supported.